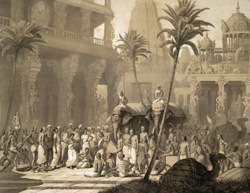 Lithograph of the interior of a temple at Kanchipuram in Tamil Nadu by L.H. de Rudder (1807-1881) after an original drawing of July 1841 by Prince Aleksandr Mikhailovich Saltuikov and published in Paris in 1848. This print shows the daily prayer ritual of the Brahmins in honour of the god Vishnu as Preserver and Shiva as Destroyer. Kanchipuram was the Pallava capital in the 7th and 8th centuries and continued to be an important centre under the Chola, Vijayanagara and Nayaka periods.